Prior to beginning graduate school, Callie worked as a certified nursing assistant at a skilled nursing facility and medical assistant at a federally qualified health center. These experiences, coupled with a family member’s hospital stay, led her to pursue a Master of Health Administration. During her time in the Master’s program at UAMS, Callie has actively pursued opportunities to complement her academic training and skills. She started working as a graduate assistant at the UAMS Myeloma Institute in her first year, and subsequently started her roleas a Baptist Health Administrative Intern. Callie also serves as the Vice President on the MHA Student Association. Under her leadership, the organization has focused on increasing the integration between students and healthcare leaders by organizing professional development sessions and increasing the visibility of the MHA Program locally and nationally. Following graduation in May 2019, she plans to pursue an administrative fellowship. The Commission on Accreditation of Healthcare Management Education (CAHME) has named Samantha Clark as the first recipient of the CAHME/Dawn Gideon Foundation Scholarship Honorarium. The Honorarium includes a $2,000 scholarship. Samantha is a second-year student in the University of Washington Masters in Health Administration program. 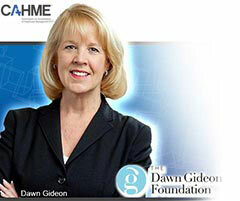 The Honorarium recognizes graduate healthcare management students who embody the spirit and attitude of Dawn Gideon.